Picture: The easiest blackberry recipes are jam and coulis. Perhaps the easiest thing to do with all those luscious blackberries is to make jam, or coulis. But there are plenty of other options, too. Blackberries are wholesome and nutritious. They have good amounts of vitamin C and the seeds are rich in vitamin E.
There are lots of easy ways to prepare them and they are easy to find throughout August and September in many country areas. The best of the season is over by Michaelmas (at the end of September). But in some seasons you can still pick usable fruit in October and even early November. The quality is not generally so good with later fruit. It's even quite a pleasant task collecting them, apart from the odd scratch, of course. Pick on a dry day after a dryish spell. Pick the bright shiny looking ones. If they are over-ripe they start to lose their shine. Don't pick near roads because of the pollutants which may affect the fruit. Roadside berries may be larger, however, because of the increased levels of CO2. It's certainly worth avoiding any field margins where crops may have been sprayed with toxic chemicals. Of course you can use fresh commercial or home grown fruit equally well. You can get blackberries earlier in the year from fruit farms. For recommended books on jam and preserve making click here. Easy Blackberry Recipes: First, jam. Jam is very easy to make and it can be used as an ingredient in its own right. It is an excellent way to store excess fruit. If you are not already a jam maker, start with small quantities at a time. The process is far easier to control. First, rinse the blackberries for a few moments under running water. After all, flies are quite fond of them, too. Remove any stalks or over-ripe fruit and then weigh them. Put the washed and weighed fruit into a large heavy saucepan. Stainless steel is ideal. Traditional brass preserving pans are OK but they do tend to leave a slight taste from the metal, which can't be good. Cast iron, on the other hand, actually provides us with traces of iron which our bodies can use to bolster iron levels in the blood. Satinless steel is best because there is no imparted flavour and blackberries are in any case a fairly good source of iron. Add 1 pound of sugar for each pound of fruit. Heat slowly until the sugar dissolves, stirring all the time. When the sugar has totally dissolved you will not be able to feel it when you press the tip of a wooden spoon into the mix. If you feel a slight crunch, or grittiness, keep stirring! When you are sure it's all dissolved, turn up the heat until the jam mix boils freely. You will find that it rises up in the pan and gets quite frothy. This is why you should choose a large pan for the amount of fruit. Skim off any scummy looking froth from time to time. You can skip this bit by adding a small knob of butter at the end. Start testing for setting point by dropping a little of the mix onto a cold plate. The jam is set when it wrinkles as you push it sideways with the tip of a spoon or your finger tip. If you want to be sure that the jam does not become over-cooked, you should take the pan off the heat while you test for the setting point. When setting point is reached turn off the heat and bottle the jam. You must used sterilised and hot jars for this, otherwise you risk the jam cracking the pots. Sterilisation is important to stop bacteria and moulds spoiling the jam. You can sterilise with sterilising fluid or you can just boil the jars in hot water in a pan for a few minutes. It is best to lift the jars off the surface of the pan with a trivet. Dry them thoroughly before adding the jam. Alternatively, clean the jars thoroughly in hot soapy water, rinse them and dry them with a clean tea towel and then heat them in a medium oven for about ten minutes. If for any reason you do use cold jars, always put a metal spoon into the jar to transfer some of the heat from the jam. If you don't do this you risk the jar cracking from the sudden change in temperature. Cover and seal with jam paper (wax paper rounds, usually sold with labels and cellophane covers) and close-fitting lids or cellophane. You can find jam covers and labels in the co-op in the UK. Cling film is also OK as a temporary cover. You can cut your own rounds to cover the jam from greaseproof paper - but it's a bit fiddly. Covering the jam with greaseproof paper rounds helps to keep out unwanted spores and so deters mould. You can use recycled jam jar lids, too but make sure they are really clean and well sterilised. Check the contents every few months if you are storing jam for long periods. Suitable jars and lids such as the ones pictured here and above are available from Amazon. You can add a little lemon juice if you like. It helps with setting because it is a natural source of pectin and helps the flavour, too. If you like a firm-set jam, just add a little fruit pectin with the sugar. You can buy sugar which already has added pectin but it tends to be relatively expensive. Another way to be sure of the jam setting properly: add some apples because they are naturally high in pectin. Apple and blackberry is a great combination but keep the blackberries as the main ingredient or the jam will tend to be a bit bland. For most variations just keep to the proportions: for every pound of fruit a pound of sugar. This will ensure a product which keeps well. 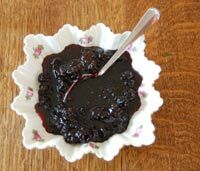 Most blackberry recipes for jams and jellies can be adapted to other fruit depending on pectin content. Blackberries mix well with raspberries and blueberries for example. They also go very well with plums. Blackberries also make an excellent coulis which can be added to yogurt or other desserts. Follow the recipe here: Easy coulis. Some people may prefer to make a coulis from strained blackberries, as the pips can be a bit noticeable. You can also blackberries to make blackberry jelly. Here's a simple blackberry jelly recipe. First, heat the fruit gently without sugar. You might want to add a splash of water to prevent the fruit from burning. About 1/4 cup per pound of fruit is enough. Use a muslin bag or fine mesh gauze jelly bag and let the fruit juices drip through overnight into a preserving pan. Add a pound of sugar to every pint of juice and then treat the mixture as if you were making jam. Bring to the boil and wait until setting point is reached for a clear jelly. Bottle just as for jam. For more easy blackberry recipes please see Blackberry pie recipes. If you have blackberry recipes of your own, please share them by clicking the Your Tips button on the nav bar. All ideas are welcome. I haven;t made chutney with blackberries yet but I'm sure they could be a fine ingredient. There are some great books on jam making. Take a look at Making Jams and Preserves for a good basic guide. The Ball Complete Book of Home Preserving also has recipes and procedures for home canning. It contains 400 recipes for all kinds of preserves including jams, pickles and relish. It will suit the amateur or experienced jam maker alike. If you would like to get your jam making to a professional level of expertise then Blue Ribbon Preserves: Secrets to Award-Winning Jams, Jellies, Marmalades and More is the best book for the job. The author gives detailed instructions and pays plenty of attention to safety, as well as to fine tuning skills. She has certainly won plenty of awards for her jam making to back her claims! 175 Best Jams, Jellies, Marmalades and Other Soft Spreads has plenty ofrecipes for the dedicated jam eater. It is well laid out with a recipe per page in most cases. Some surprising choices too - orange juice curd or basil jelly anybody?